One of the things that I admire most about Jake Austen is that his own identity never supersedes the life of his projects. You may have heard of The Goblins (his band), Roctober magazine, or Chic-A-Go-Go (a children’s TV dance show) but his name is never conspicuously stamped at the forefront. 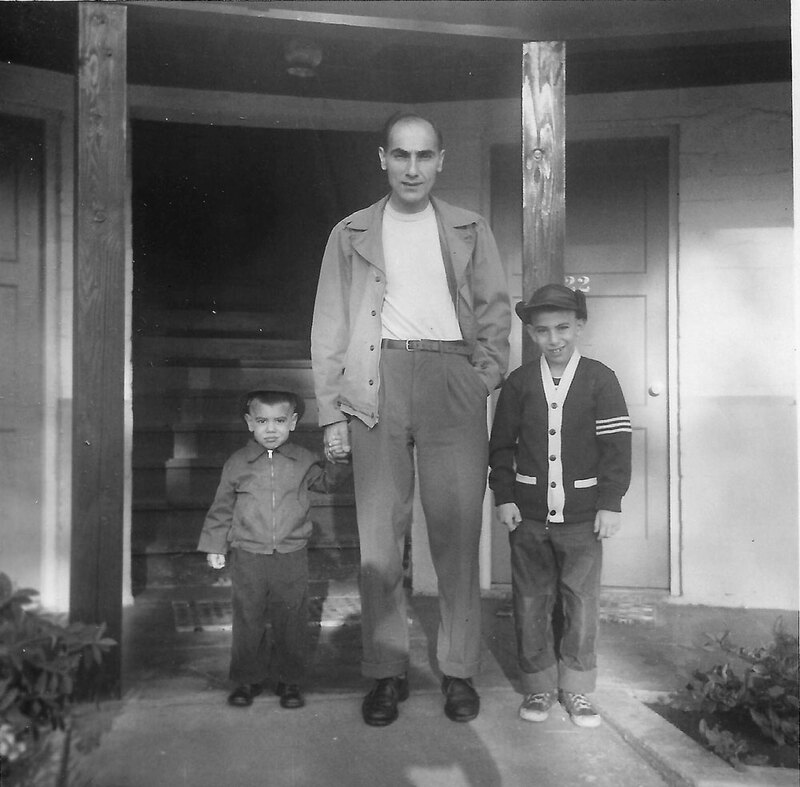 He is almost literally the man behind the curtain — operating behind a drawing table, or a mask, or a puppet. But no matter which alter ego is at the helm, you can always feel confident that Jake really is doing it for the kids. 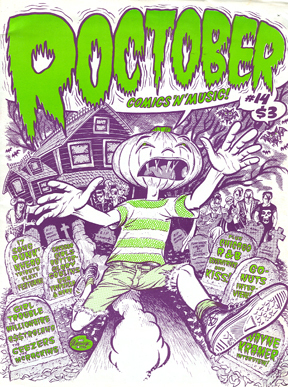 He’s been publishing the fanatical music magazine Roctober since 1992 and, unlike a lot of other fanzines that were also started around the same time, Roctober still comes out on a regular basis (2 – 3 times a year) and has never abandoned cut-and-paste layout in favor of computer graphics. The comics section has grown to around 30 pages and features cartoonists like Jerome Gaynor, Ivan Brunetti, Heather McAdams, John Porcellino, Megan Kelso, Jessica Abel, Chris Ware, Pedro Bell, and many others. 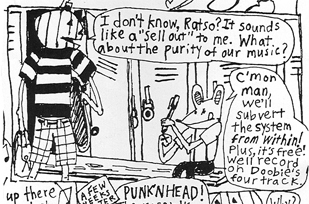 Jake’s own comic strip, Punk’nhead, chronicles the teenage exploits of a pumpkin-headed punk and his boots and braces-wearing BFF, a rat named Ratso. Much like Archie comics, each strip has a funny (or eye roll inducing) punchline and a similar high school innocence — except that the storylines in Punk’nhead have more record shopping, vandalism, and fighting The Man than you would probably find in Riverdale. Ratso sold out to the three-dimensional world in the form of a puppet and became the notorious co-host of the childrens TV dance show, Chic-A-Go-Go. When I asked Jake why Punk’nhead didn’t make the cut, he told me that he had an art school friend make the puppet for Chic-A-Go-Go and felt bad asking her to make a second one. “Ratso is a better puppet anyhow, because you have all the built in ‘eating garbage’ jokes. You don’t need any backstory to have kids get into a puppet rat.” I once mentioned Chic-A-Go-Go to the owner of Uncle Fun during a visit to Chicago and he asked, “Isn’t that the public access show where they pick up a bunch of random people from the bus stop?”, which is exactly what it’s like. It’s truly magical that all manner of Chicagoans come on Chic-A-Go-Go just to dance goofy to whatever brand of music is being offered that day. Musical guests have run the gamut from Los Crudos to the Shirelles to the Cramps to Swamp Dogg to Cynthia Plaster Caster, and let us never neglect Jan Terri. Roctober is celebrating its (almost) 20th anniversary this summer by publishing the 50th issue and releasing a book of their best interviews with Duke University Press. Also coming soon is a Roctober comics anthology and an LP collecting the best (and worst) Roctober records releases. 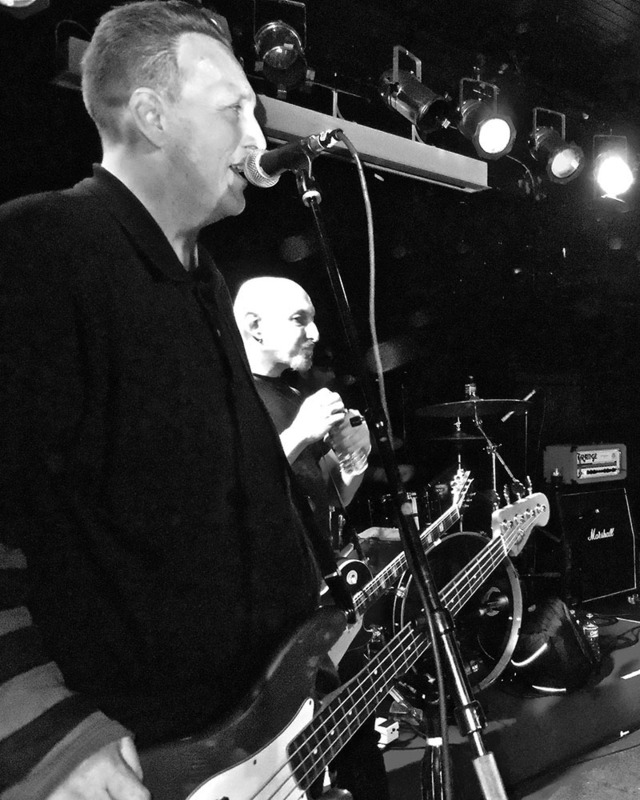 Watch The Goblins (w/Gary Burger) on YouTube here. 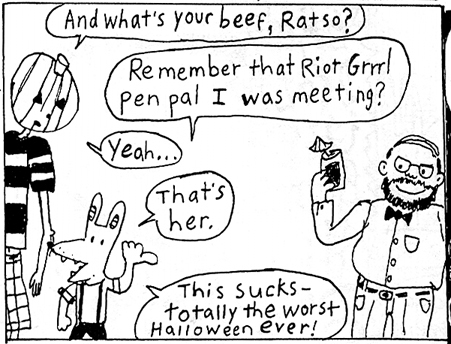 Janelle Blarg edited the Punk Comics issue of MRR and does her own awesome comic, Tales of Blarg. Check out more of her blog posts on our Comics page here.